We last heard from Joe Skipper - the British Middle Distance Champion last year - via Nina McArthur's feature on dealing with injuries. 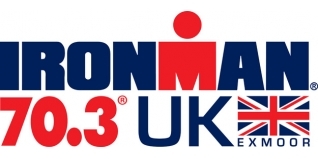 Earlier this year Joe crashed heavily in a cycle time trial, so Ironman 70.3 UK, Wimbleball would certainly be a tough test of whether he had recovered from that setback. A fifth place finish in a tough race - the most painful thing he has ever done - would suggest he has. Check out his race report below for the inside story. This race had been a goal of mine for a long time as it's supposed to be a tough course and the fact that it gets a stacked field so you can race against people of a really decent calibre. I had been training really hard for this since just after TriStar Cannes on the 29th April. I did a week training in Wales with Paul Hawkins followed by the Marshman middle (as if a middle distance triathlon isn't hard enough already). After the week in Wales I sat down with Paul Savage and we came up with a plan of attack for UK. The plan wasn't too radical really with pretty much the same sessions I was doing before my injury I sustained at the Buxton Mountain TT. As I was improving every week we would only be changing for the sake of it. This session consisted of a three hour ride with one hour at 70.3 pace, or what I hoped would be 70.3 pace, which was around 90% of FTP and started off at 320w and by the end of the training cycle (one week before), I was doing 340w. Now I'm not saying my threshold increased by 20 watts but the perceived effort was the same. After the bike I would get home where I would have all my running kit out ready, get changed as quickly as possible, and do a 30 minute tempo run at 70.3 pace or quicker over as undulating terrain as I could find near where I live - which isn't much I have to admit! I travelled down early on the Friday morning with Paul Hawkins and no sooner had we left the drama started. Just as we were about to get on the motorway I had a horrible feeling that I had forgot my helmet. I don't know what made me think it but we stopped the car I checked the boot and yep I had forgot the bloody thing! I knew Paul was not going to be a happy chappy and his response was "for f***s sake can you not try and blag one when we get down there?" Fortunately he was up for going back and I picked it up and then we were off, second time lucky. Luckily the rest of the trip was hassle free once we got down there we met up with Matt Ellis who was also racing and set off to recce the bike course, we had all heard so many different stories about it that we wanted to check it out and see how much of a pig it really was. I didn't think it was actually that bad; I would class it as rolling with two climbs each lap, my garmin recorded it as 2400 feet of climbing per lap. After reccying the course I had another little problem. I was supposed to be sharing a room with Rob Brundish and the plan was to meet him at the race site. Now this sounds great doesn't it but I couldn't ring him as there was no signal there so it wasn't until about 7pm that I ended up bumping into him which wasn't a problem in the end but I was starting to worry as I thought I was going to end up camping with Hawkins. Rob and I decided to go for a swim the day before the race as it's low impact and I like swimming the day before if I can because I find if I don't swim for 2-3 days before a race my technique can feel awful on the day of the race. Anyway, the sea was only about three miles away from where we were staying so we drove to the beach, parked up and went to "swim". We walked out got to the sea and got stuck in some quick sand, it was bloody horrible stuff as every time you took a step you sunk to between your knees and hips! We must have looked like a write pair being the only two on the beach in wetsuits crawling to try and spread the weight out so we didn't sink. Eventually though we got back to the car drove to another beach and got a decent swim in. After the morning's antics we went to the race site, racked the bike and then had the endurance event of waiting in traffic for at least and hour and a half to get out of the field so we could get home. At the B&B Rob and I were chatting about what we both thought was a good result, a great result and what our game plans were. I said a good result would be top ten, a really good result would be top five and my aim was to swim hard, smash the bike and hope for the best on the run. We both said we just wanted to give it 100% and had kind of a pact that we would make sure we were on the limit all the time. To make us feel better we had it in our head that it didn't matter if we felt nailed on the run as it would only hurt for 80 minutes (A bloody long 80 minutes). If you haven't closed the tab on me and are still here, this is how the race went. I thought I would try something a bit different and I started about 15 metres over from the main group with one other person. This enabled me to get a really good start without taking a battering. I felt like I had a really good swim as well and got out in just over 25 minutes. There was a run up to transition and instead of just putting my helmet on I put some socks and bike shoes on as well. The reason I did this was you can tighten the velcro up tighter, the run to the bike was on grass so you would be able to run at the same speed without damaging the cleats, the mount line was on a hill so it was much easier to get going with shoes already on. I could tell I felt good on the bike from the off as I was breathing hard. If I'm not going that well it's my legs that are the limiting factor as they will feel heavy and my breathing isn't that deep. If I do a race without tapering I am likely to feel more like that but tapered and fresh I was hoping to be able to push it really hard and get the lungs working. Not long after starting the bike I overtook Paul Amey who is the GB record holder for the ironman which he set in november last year at Arizona with 8.02. I couldn't believe it and I thought yes, I have an ally for the bike but when I went past him he didn't come with me so I just kept my head down and well just f****n spanked it. I got onto the main road and asked someone what place am I in, and he said 7th. I thought no way, 7th already (!) I couldn't believe it as I was expecting him to say 15th or worse so this was so motivating and really encouraged me to work hard. I kept my head down and passed Paul Hawkins a bit later and then Ben Howard. We kept together as a group and eventually caught Harry Wiltshire and Mark Threlfall after about 17-18 miles it was between the bottom of the dodgy decent onto the main road and the steep climb. A little bit later Harry fell off the pace. I didn't like riding in the group as the pace felt easy and this isn't what I wanted so knew I had to try and drop the others. Cycling is my strength so I need to play to my strengths and get a gap, not to mention Fraser Cartmell and Philip Graves were up the road and as Ben Fish says who I work with at Royles, "win by the biggest margin or lose by the smallest", it was as if I could see him saying it to me so I thought right, the first opportunity I get I'm going to absolutely drill it and if I can't get away, I'm going to make them hurt. The first opportunity to really try and get away was the hill at the start of the second lap. It's shortish and steep but it's flat over the top so you can keep the pressure on right and if you get a gap there is no respite for them so once we started the climb it felt fairly hard and I thought this is good as I knew if I was finding it hard the others would be to. I went as hard as I could and just kept the pressure on. Luckily I managed to get a gap so just kept the pressure on. At the start of that climb they gave us time splits to the two leaders; four minutes to Graves and 2.30 to Cartmell. I kept getting time splits to Cartmell and couldn't believe how quick the gap was coming down and at the bottom off the steep descent I managed to catch him. It was quite funny really once I caught him as I was in my Manchester Tri Kit and I think everyone thought I was some chopper or random age grouper that had jumped on his wheel as whenever we went up a hill with spectators they were cheering him on and giving him time gaps to Phil but no one was even acknowledging me. When we finished the second lap they knew he had finished but tried to send me around for another lap! I actually found it quite amusing though to be honest. Sounds quite easy, executing it though is a completely different ball game and staying with Fraser wasn't happening as he put a bit of a surge in up some grass uphill section and I just couldn't stay with him. I tried my hardest but I was really suffering, this is the bit that I love about these 70.3s the mental part and constant fight to keep a high pace and not give into the demons that tell you to slow down. I think in every half I've done even when I've been going really well you still get these demons but you can tell you are moving well and know you are onto a good result so the suffering is worth while but when the running seems hard it can be easier to give in but you have to expect it and as Jens Voigt says shut up legs! Anyway, after about two miles you get onto this dam where you run out-and-back; it gives you a chance to see anyone who is within about three minutes of you and to my surprise I saw Mark, Ben, The German guy who came second and Fraser behind them. Somehow he went the wrong way, I have no idea how, but I was in second and couldn't believe it. After about 3.5 miles I got overtaken by Mark and the German and then on the second lap Fraser went past me. I was now in fifth place and for the rest of the run had a constant battle with Ben Howard. I could see he was hurting but I was absolutely nailed as well and felt like I was doing a death march. He had me down to 30 seconds at one point with a lap and a mile to go and I thought to myself, give it everything you have Joe for one lap and if you still have 30 seconds with one mile to go fifth place is yours. The next chance I got to see him was on the dam for the last time and I saw that I had taken a little bit more time out of him but not much, and it was still going to be touch and go as I was blowing up big time and didn't even know if I would make it to the end. The next chance I got to see him was at the point with one mile to go and to my surprise he was nowhere to be seen but now I had Paul Amey chasing me down and he was running like a man possessed. I thought oh no, I dug deep into the hurt box and just managed to hold him off but it wasn't pretty and I was a spent force at the end so final position was fifth and time was 4.27. I have never felt so f****d (!). Everything hurt; my arms, my legs, just everything but I absolutely loved it. To me that was a proper race and I just wish there were more races in the UK with that strength in depth in the field as it's just so intense and is all out for four and a half hours and I loved that. To me that is a proper race and if it wasn't for the cost of getting to these Ironman branded races I would be doing a lot more of them. My next 'A' race is going to be Wiesbaden. It's the European 70.3 champs and I want to have a really good race there, I'm addicted to them and can't wait! In the meantime I will be racing Liverpool 5150 on the 1st July, Tristar Milton Keynes on the 29th July and maybe another one in between. I would like to do Antwerp 70.3 but will have to work out the costs. Wimbleball Pro race reports summary/links.